A tool for analysing and demonstrating traceability between a work product and its specification. 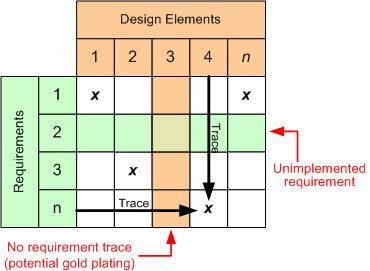 The figure provides an example of tracing from software requirements to a design. An X in a cell of the matrix indicates that the design element satisfies the corresponding requirement. A blank column (e.g. Design Element 3) indicates that an element does not satisfy a user requirement. The existance of the offending element may therefore be due to "gold plating" (adding "neat" features to a product without a request from a customer). A blank row (e.g. Requirement 2) indicates that a user requirement has not been satisfied by the design solution. The design may therefore be incomplete.